Numerous devastating neurodegenerative disorders in humans, such as Huntington’s and Alzheimer’s disease as well as a disease known as spinocerebellar ataxia, are linked to specific cellular proteins which accumulate in the cell. The proteins form damaging plaques and cause the progressive dysfunction and death of neuronal cells in the brain. The new findings were discovered by an international team of scientists from the University of Konstanz’s Collaborative Research Centre 969 “Chemical and Biological Principles of Cellular Proteostasis” (Germany), the interdisciplinary Astbury Centre for Structural Molecular Biology at the University of Leeds (UK) whose research focus is “Life in molecular detail”, and the Departments of Biology and Genetics at Stanford University (USA). As Elke Deuerling, Professor for Molecular Microbiology at the University of Konstanz and one of the lead authors on the study “Dual role of ribosome-binding domain of NAC as a potent suppressor of protein aggregation and aging-related proteinopathies”, which is due for online publication in the journal Molecular Cell on 11.04.2019, emphasizes: “What is so fascinating about this is that NAC can recognise different types of aggregation-prone proteins and prevent them from aggregating. NAC is a very abundant cellular protein and seems to be involved in many processes that maintain cell fitness, health and functionality. We believe it to be one of the most important chaperones in the cell”. The international research team identified the positively charged ribosome-binding N-βNAC subunit (N-βNAC), which is merely 40 amino acids long, as the crucial NAC domain responsible for exerting chaperone activity off the ribosome. The Stanford team demonstrated that a small peptide within this sequence can successfully prevent aggregation of disease-linked polyglutamine-expanded proteins, including Huntingtin, causing Huntington’s disease, and Ataxin-3, causing a form of ataxia. “This came as a huge surprise”, comments Martin Gamerdinger. “What this implies is that N-βNAC effectively fulfils a dual role: It is responsible for binding NAC to the ribosome and, off the ribosome, for inhibiting protein aggregation of PolyQ proteins”. The Leeds team chemically linked NAC to two proteins it helps to protect from forming toxic aggregations in the cell, Ataxin-3 and Amyloid-β 40, which are associated with spinocerebellar ataxia and Alzheimer’s disease, respectively. Mass spectrometry experiments were then used to find out which precise parts of the chaperone and proteins were linked together. The results were clear cut and surprising. “We found that one specific region of the NAC chaperone binds Ataxin-3 and when added in isolation is sufficient to inhibit PolyQ aggregation”, says Professor Sheena Radford. “However, looking at Amyloid-β 40, we found that there is at least one more chaperone domain within NAC that we have yet to uncover. We can clearly see the effects that this domain has – it completely suppresses protein aggregation in both cases. But we have not been able to identify this second binding site for Amyloid-β 40 yet”. One future task for the researchers will be to identify these unknown NAC substrate interaction domains. Another will be to further develop the results of the study for medical application. “Being able to clearly identify one important chaperone domain within NAC has huge implications for the development of therapeutic approaches to help combat neurodegenerative disorders”, Professor Judith Frydman stresses. “Increasing the concentration of NAC in cells to suppress protein aggregation isn’t universally beneficial. But being able to work with the small NAC fragment N-βNAC – or with even smaller peptides only 20 amino acids long that we managed to identify within N-βNAC – could be a game changer. We may not be able to cure diseases such as Huntington’s or Alzheimer’s any time soon, but we may be able to delay their progress”. Original publication: Koning Shen, Martin Gamerdinger, Rebecca Chan, Karina Gense, Esther M. Martin, Nadine Sachs, Patrick D. Knight, Renate Schlömer, Antonio N. Calabrese, Katie L. Stewart, Lukas Leiendecker, Ankit S. Baghel, Sheena E. Radford, Judith Frydman, Elke Deuerling. Dual role of ribosome-binding domain of NAC as a potent suppressor of protein aggregation and aging-related proteinopathies. Molecular Cell, 11 April 2019. DOI: 10.1016/j.molcel.2019.03.012, URL: https://www.cell.com/molecular-cell/fulltext/S1097-2765(19)30186-8 (DOI and URL active from 11 April 2019, 11:00 US ET). Study conducted by an international team of molecular biologists and biophysicists from the Universities of Konstanz (Germany), Leeds (UK) and Stanford (USA) is the first to demonstrate conclusively that NAC directly exerts chaperone activity toward structurally diverse model substrates associated with neurodegenerative diseases such as Huntington’s, spinocerebellar ataxias and Alzheimer’s. The positively charged ribosome-binding domain of NAC (N-βNAC) has been shown to suppress protein aggregation and proteotoxicity of polyglutamine (PolyQ) proteins. Supported by research grants from the German Research Foundation (DFG), the Human Frontier Science Program (HFSP), the German state of Baden-Württemberg (Professor Judith Frydman’s guest professorship at the University of Konstanz), the Wellcome Trust, the European Research Council (ERC) under the European Union’s Seventh Framework Programme, the Biotechnology and Biological Sciences Research Council UK (BBSRC) as well as the National Institutes of Health (NIH). Caption: Aggregation of PolyQ35 protein in C. elegans is suppressed by NAC. The images show the head region of worms expressing a Huntington’s disease related polyglutamine-expanded protein (PolyQ35). 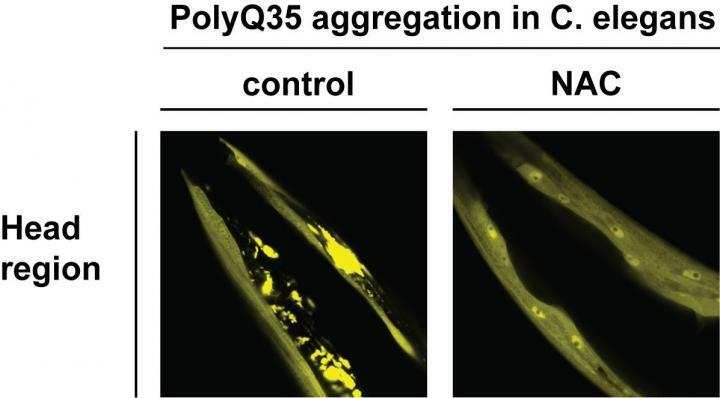 Overexpression of NAC in the worm (right image) prevents aggregation and toxicity of PolyQ35.